The app has completely transformed the way we host events by providing everything our attendees need right at their fingertips behind an easy-to-use interface. 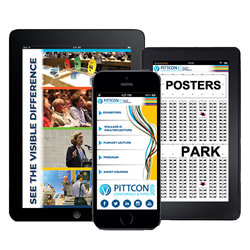 The Pittcon marketing department is excited to announce the release of its official conference and exposition mobile app, Pittcon 2019. The Pittcon 2019 mobile app serves as your all-in-one event guide with valuable information to help plan and navigate the conference and exposition. Attendees can view Technical Sessions, Exhibitors, Networking Sessions, Short Courses, schedules for the DemoZones and NEXUS Theaters, and much more. Additionally, the mobile app consists of various cutting-edge features including the ability to build your schedule and add personal meetings, look at gaps in your daily calendar and easily fill them, find your way around using interactive floor maps, share your thoughts through session comments or built-in social media, note taking, and more. The Pittcon mobile app was developed by ATIV Software and is built on the EventPilot meeting app platform. ATIV has implemented the media-rich conference app EventPilot since the beginning of conference apps on smartphones in 2010 and helped many event planners create an offline meeting app for their attendees while reducing the waste and CO2 footprint. They have fast performance, easy for non-technical users and work without requiring WiFi access. The mobile app also synchronizes with the Pittcon at a Glance planning tool available at http://www.pittcon.org/plan-your-pittcon/. “By choosing the EventPilot scientific meeting app, Pittcon demonstrates how much the organization values an exceptional attendee experience," said Silke Fleischer, CEO and Co-Founder of ATIV Software. "Scientific meetings with such a large expo and thousands of academic poster presentations require highly specialized event technology like EventPilot. Pittcon meeting planners and attendees can fully rely on the event app to stay organized and make the most of the conference."